Sending the Yak to the superdoopermarket/green grocers is a hit and miss thing. He is very good at buying utilitarian dried goods (think loo paper, environmentally friendly toilet cleaner in the shape of a duck or gluten free taco shells) but one has to be extremely specific when it comes to fruit and vegetables. Point in case….I once asked for some green beans. He came back with eight, yes eight, (count them people) individual green beans. I could have created an art installation from them but finding a way to incorporate eight beans into a recipe was a tad beyond my imagination. Curiosity led me to pondering the Greek connection between ground corn and food. Googlebumbling revealed that ground corn has indeed been used in Greek cooking in various ways for several hundred years. It possibly arrived in Greece, courtesy of the Turkish Ottoman Empire by way of Africa. 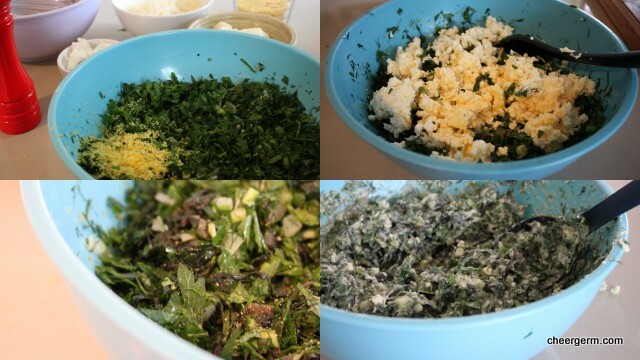 Amongst other uses, it is sprinkled atop leafy green pies or placed underneath to soak up the juices. I have added the link to the very interesting article, after the photos in this post. Once upon a time, I used to favour a spanokopita recipe by Matthew Evans (a former chef and food critic, now television host). It contained an abundance of herbs, leafy greens and cheese. Having lost this recipe, I now make it merely from memory. (Not the most reliable of sources.) Do not freak out at the amount of herbs in this recipe. It seems a lot but it works. Need it be said, The Yak did not do the shopping for this dish. This pie is audaciously herbaceous. The salty hits of feta and kefalograviera (a salty Greek hard sheeps milk cheese), combined with the slightly sweet corn polenta, balance the meadowy punch in the face. But this is the kind of face punch that you happily go back for. 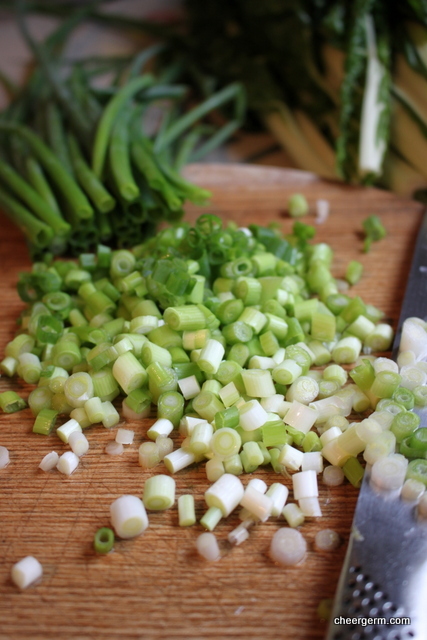 In a large frypan, sauté the chopped onion for a few minutes until they start to become translucent, add the chopped spring onions, sauté for one minute. Remove the mixture from the pan into a large mixing bowl and allow to cool. Re-heat the pan to a medium heat, add the chopped silverbeet along with a big squeeze of lemon and cook, stirring regularly until it has wilted and most of the liquid has evaporated. When it has cooled, squeeze out any remaining liquid. Mix well, taste and check for seasoning. Smooth this mixture into a large oiled baking dish, I use a 3 litre rectangular Pyrex dish. Preheat the oven to 180 C if you are cooking the dish immediately. For the polenta. Heat the water in a medium saucepan until it just starts to boil. Using a whisk, slowly pour in the polenta, continuing to whisk. This is important as it avoids lumpy polenta. Change to a wooden spoon, turn the heat to low and continue to cook the polenta, stirring constantly for 4-5 minutes. Add the butter and 1/4 cup of the kefalograviera, it should be of a spreadable consistency. 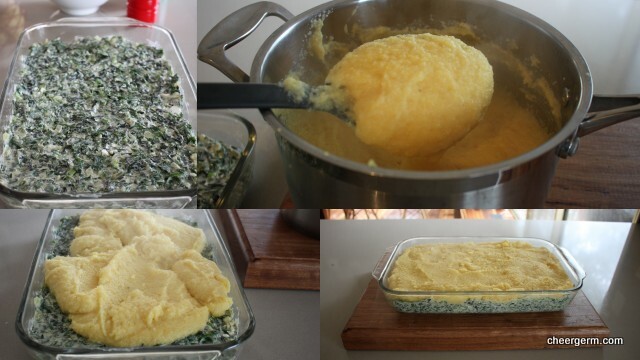 Remove the polenta from the heat and immediately, spread it over the silverbeet, herb and egg mixture. Let the pie rest for about 15-20 minutes until it has set a little bit. Serve with a green salad, or roasted veggies. Cooking Notes: silverbeet is also know as chard. If you cannot find Kefalograviera, use Pecorino, Parmesan or Gruyere. 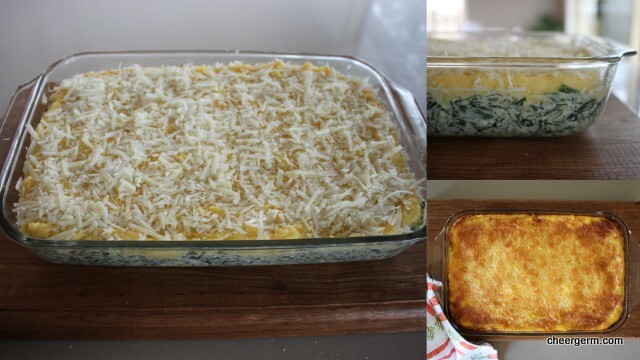 This entry was posted in Easter, Gluten free main courses, Vegetarian and tagged chard, cheergerm, Cooking, Easter, food, gluten free, Greek, polenta, recipes, silverbeet herb and polenta pie, Spanokopita, Vegetarian. Bookmark the permalink. This looks so good, Mrs Golden Beck. I am with you on the herbs- the more the better. 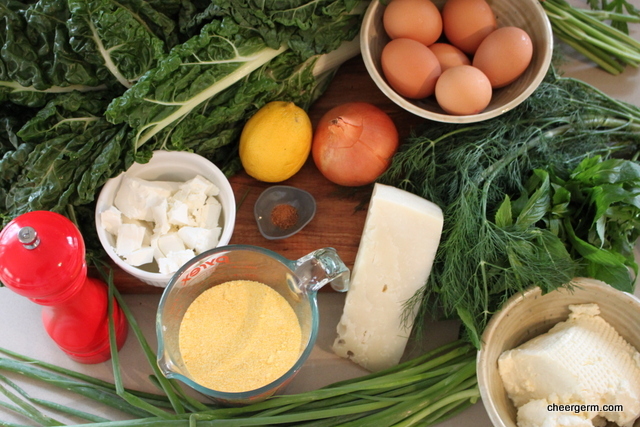 Love the idea of polenta in place of filo pastry, as polenta is ore likely to be lurking in the pantry as a staple. I will make this when I get back from my trip! Why thank ye kindly Signora Italian! Polenta is one of those great pantry staples hey? Hope you are having a hoot on your trip. Brilliant! Yes, you are spot on with the Ottoman-corn connection. They also introduced rice to Greece. Pontic Greeks (immigrants from the Black Sea area) are really keen corn eaters. And, silverbeet is the most common “spinach” used in Greece. My Greek friends turn their noses up at the tender stuff we get here. Love the herbs in your filling – exactly what I do as well. This looks like something even the polenta haters (not me!) in my house might like. Thanks KW! I did think of you when posting this and your Greek connection and knowledge, great extra information there on the rice and the silverbeet! 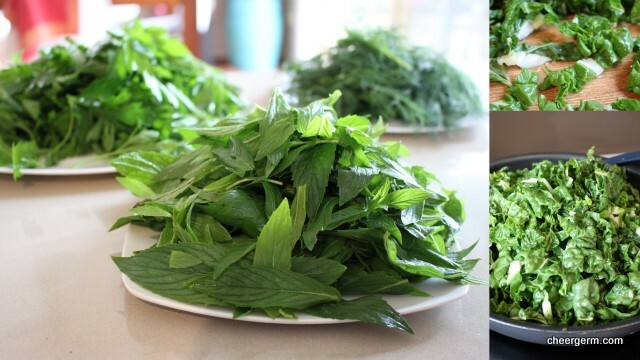 Mum used a lot of silverbeet when we were growing up and I too love the extra oomph it has. Hopefully this will persuade those polenta naysayers!! Just made it – naysayers were told it was a “corn bread” top – went down a treat! Ha! Fantastic, a great way of delivering it KW! I always learn something from your posts, and most especially new vocabulary. What a gorgeous word, silverbeet! From the photo, I suspect it is what we call chard. Naturally I am a big fan of any pie with herbs, greens and cheese 🙂 The polenta topping is perfect! Yes, it is making me hungry for spring vegetables and real herbs from the garden rather than those forced grocery store ones. Your recipes are always unusual and perfect, but for the life of me I can’t know why you aren’t taking photos for restaurants and other food-related ventures. I will admit after I read your post, I go back through just for another gander at your lovely crisp photos! Ah, what a nice thing to say! For the ones I get right, there are a motza that look pretty average. It has been a good trusty camera, I recently replaced the lens as it carked it! Hey, just wanted to say, Eggy Bread was a total hit this morning! They are most grateful to you! Super glad it went down a treat, yippee!! Oh, Cheergerm, what a gorgeous pie. 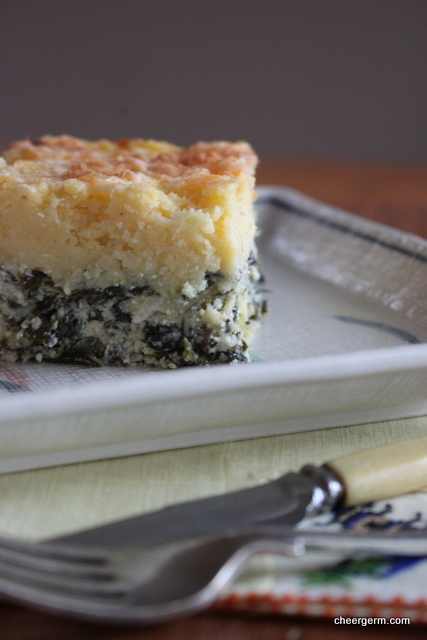 My kids adore spanokopita and reading your version of it has whetted my appetite to toss the blankets of crispy butter and flour and use the cornmeal. Grits are a staple here in Virginia, so there’s always an abundance of yellow and white meal in the pantry. As a writer, I often feel it necessary to speak up when I see other’s words that are somewhat extraordinary, and today’s post, Cheer, was so wonderfully written. Your sense of humor truly shines through this piece, and your unique and quirky voice pulls me into the post like it’s a breezy beautiful ride I don’t want to get off. Congrats. I loved it. And many thanks for the terrific link to Ms. Kochilas’s web site. 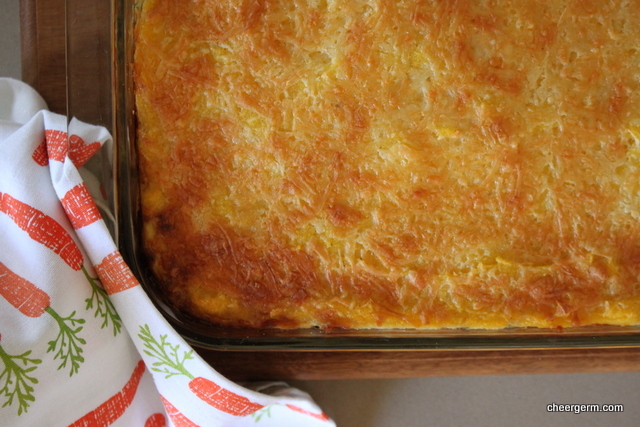 That recipe she created for Sweet Greek Corn Cream is going on the grocery list. I shall give it a test in preparation for Turkey Day–if I can find the lone remaining pumpkin to work with! One of my favorites this week. Oh Mrs Peak. You have completely made my day with your comments. Regarding the pie and this collection of my words. Truly. ☺️ Cornmeal is such a versatile ingredient, you must do some pretty yummy dishes with it as well. 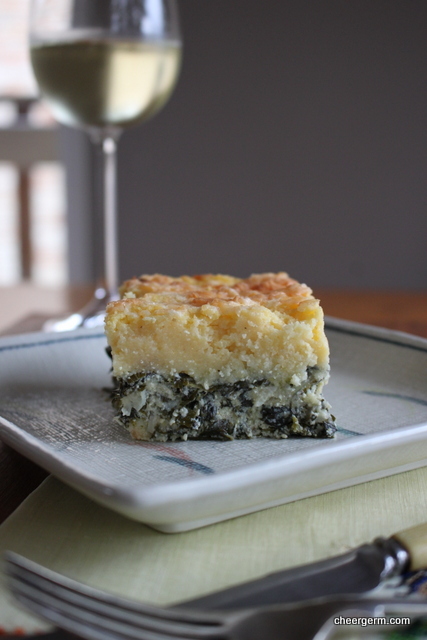 How good did that Greek Corn Cream look? I am sure it will be a fabulous accompaniment on your Turkey Day. Gobble, gobble. Shame about the kid being sick – nothing worse. Good for you, catching up on Easter like this! This sounds lovely! ❤ thank you for sharing. I’m lost for words, unusual for me, but I love your idea and always admire your ingenuity, Cheery. Polenta pie, wow, it sounds great and looks delicious! Thanks for sharing this great recipe! I will definitely try it. Thanks for stopping by, it’s a great wee recipe, tasty and a great dish for a shared table.